RESEARCH TRIANGLE PARK, NC--(Marketwired - April 25, 2017) - On average, half (50%) of surveyed global teams' pharmacovigilance funding is contributed by a standalone drug safety team, according to data published by industry intelligence provider Cutting Edge Information. 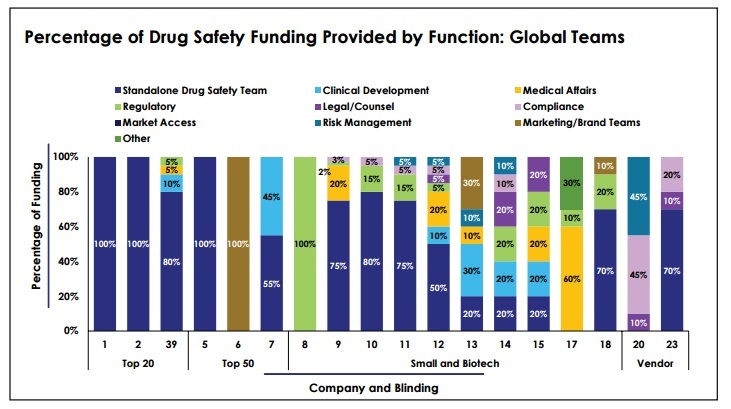 The data from Pharmacovigilance: Balance Signal Detection and Case Management Responsibilities with Emerging Drug Safety Regulations found that of the remaining 50%, an average 11% comes from regulatory affairs, and 8% each are funded by clinical development, medical affairs and marketing/brand teams. Furthermore, a combined 15% of surveyed global teams' pharmacovigilance budgets come from legal, compliance, risk management and other sources. The source of funding is a little more varied when looking at individual teams' budgets, according to the data. Standalone drug safety teams provide the majority of drug safety budgets -- at least 70% of budgets among half of surveyed global teams. In fact, the study found that only 4 of 18 teams do not receive any funding from a standalone drug safety team. Of these teams, one company's entire pharmacovigilance budget comes from marketing, and another team's budget is allocated by regulatory affairs. Regulatory affairs provides some level of funding for half of surveyed individual team budgets, underscoring the importance of regulatory affairs in pharmacovigilance. Clinical development contributes to at least 10% of budgets among one-third of surveyed teams -- with 45% at one Top 50 company's team. "Budget-building and outsourcing management are key to devising a pharmacovigilance strategy," said Adam Bianchi, senior director of research at Cutting Edge Information. "Because spending and outsourcing practices vary by individual drug safety activity, each pharmacovigilance team will have to assess their own abilities, market factors and vendor capabilities to determine their outsourcing practices." For example, at one surveyed company, 60% of its funding comes from medical affairs, 10% from regulatory and the remaining 30% from quality assurance. On the other hand, another surveyed company reports receiving 45% of its budget each from compliance and risk management, with the remaining 5% coming from legal. Determine best-fit budget allocations to different pharmacovigilance activities. 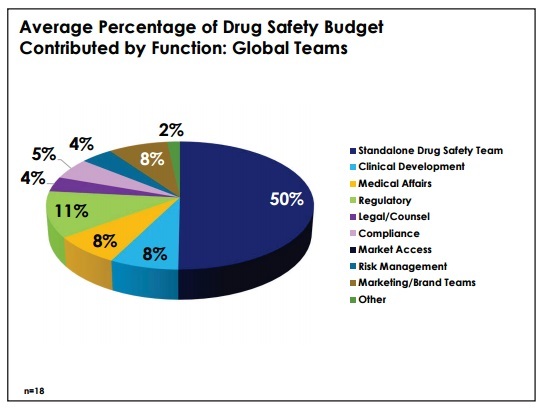 Identify the percentage of costs teams should outsource for different drug safety activities. Explore companies' case management approaches and gain top executives' recommendations concerning for improving existing case management procedures. Determine what percentage of drug safety funding should come from different groups within a life sciences organization. Develop structures that best align with their needs -- as determined by the number of products within their pipeline and the relative complexity of these products. For more information about Cutting Edge Information and its drug safety benchmarking data, visit https://www.cuttingedgeinfo.com/.